Lebanon is saddled with a multitude of water and wastewater infrastructure investments that are failing to adequately deliver benefits to its people. The companies that provide water face crippling staff shortages and an aging workforce, poor customer relations, low tariffs that fail to recover operating costs, lack of metering, excessive nonrevenue water, and years of underinvestment in the water and wastewater infrastructure. 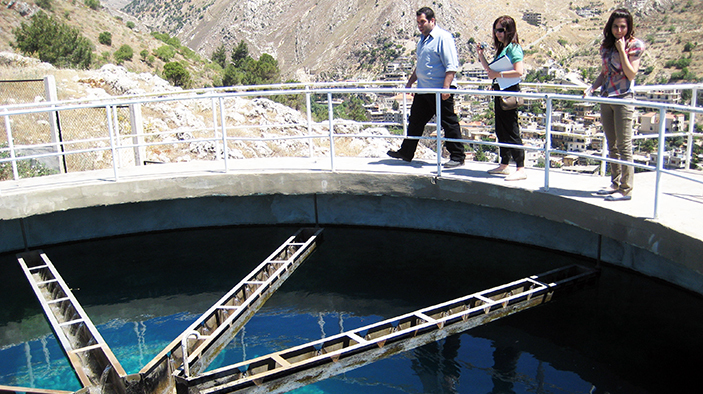 Since 2009, the Lebanon Water and Wastewater Sector Support (LWWSS) project has been addressing these challenges by partnering with Lebanon’s four water establishments and the Ministry of Energy and Water. LWWSS provides training and technical assistance related to improving operational and management efficiency, customer service and outreach, financial viability and cost recovery, and capital investment planning. Additionally, LWWSS is addressing critical capital infrastructure needs, selecting projects with promise to improve water or wastewater service delivery to 1 million people. Strengthen the financial and managerial capacity of water establishments through integrated finance management systems and business process optimization. Enhance technical and operational efficiency of water establishments, through tools for demand management and nonrevenue water reduction. Enhance drinking water quality through adoption of water-testing protocols, planning, capacity building, and water-quality infrastructure upgrades. Rehabilitate the most deteriorated pump stations to increase the number of hours of water supplied to customers and increase energy efficiency. Supply metered household connections and commission water distribution networks to establish water service to rural households. Improved water services for nearly 3 million citizens, or almost half the population. Improving water supply to 107,000 inhabitants through enhanced treatment of drinking water in the Beka’a Valley. Improving pump station efficiency and water service through equipment replacement that benefits 185,000 people. Upgrading water analysis laboratories, enabling the water establishments to meet national testing standards and benefitting 700,000 people in the Beka’a Valley and South Lebanon water establishments. Improving health and safety practices through training for infrastructure operators supplying water service to 500,000 inhabitants. Training staffers at the water establishments to design and update five-year business plans, enabling them to adhere to national strategic guidelines, plan medium-term goals, and adopt benchmarking processes to monitor and evaluate performance. Promoting water conservation in schools and in rural regions, covering a population of 150,000. DAI works with the Government of Mauritius to improve capacity and coordination across key institutions dealing with climate change.